Edinburgh Monarchs look to be on course to reach the Premier League speedway Knockout Cup quarter-finals after taking control of last night’s first round first-leg clash against Plymouth Devils at Armadale Stadium. After a faltering first couple of races Monarchs eventually prevailed 54-36, a handsome lead for tonight’s deciding tie at the St Boniface Arena and a devil of a job facing Plymouth to pull back their deficit. Monarchs German star Kevin Wolbert was the Capital outfit’s top scorer with 13 points from his five outings. His hopes of a maximum were dashed in the last race when he had to settle for third place. Monarchs co-boss John Campbell had warned of the threat Plymouth posed and after guest Steve Worrall headed home Monarchs skipper Sam Masters in the first heat this was underlined in letters writ large. And there was a big shock for Monarchs in the next race when Plymouth reserve duo Stefan Nielsen and Ellis Perks grabbed a 5-1 against Max Clegg and Dan Bewley who fell off before remounting. But Ryan Fisher and Bewley steadied the ship in the fourth race with a 5-1 over Sam Simota and Perks which tied the scores 12-12. Monarchs took a two-point lead for the first time in heat five when Wolbert and Jye Etheridge scored a 4-2 over Worrall and Nielsen. 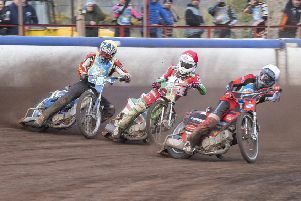 The home side then suddenly found their spark and a 5-1 from Masters and Erik Riss in the sixth race opened up a six-point lead 21-15 which gave the Devils some food for thought after their strong start to the meeting. It got worse for the visitors in the very next race when Fisher and Clegg piled in with a 5-1 to stretch Monarchs’ advantage to ten points, 26-16. And that gap was maintained at the halfway point when Riss took the chequered flag to share the points 3-3 in heat eight, Monarchs now looking a lot more comfortable. The match was starting to run away from Plymouth after Masters and Riss claimed their second 5-1 of the night in heat ten against Todd Kurtz after his team-mate Jack Holder was excluded after tumbling off on the pits bend. Monarchs now led 37-23 and were on easy street, especially with no tactical rides allowed in the cup competition. And with Monarchs sharing heats 11 and 12 their 14-point advantage looked even more healthy. And a 5-1 from Masters and Ryan Fisher in heat 13 stretched Monarchs’ lead to 18 points, 48-30 as the Devils floundered under a points onslaught. Monarchs: Wolbert 13, Fisher 12, Masters 11, Riss 8, Clegg 7, Bewley 2, Etheridge 1. Plymouth: Worrall 12, Nielsen 8,Kurtz 6, Holder 5,Simota 3, Perks 2.